The region of Valencia is located in the east of Spain and is well known for its ceramics, fans, oranges and wicker-work. The Valencian coast consists of many beautiful resorts with golden beaches and towns full of history. Inland, the soil is fertile and the region has adopted the nickname 'the bread-basket of Spain'. Valcencia is rich with history, natural beauty and culture. Wherever you go in the region of Valencia you are bound to come across plantations of oranges. In parts of the region, the orange trees are surrounded by olive trees, almond trees and in some areas, by rice paddy fields. The Valencia region is served by Valencia airport and in the south, by Alicante airport. The capital of the region of Valencia is Valencia city. Valencia city is well connected within the road network, namely by the N340 to Barcelona and Alicante, the NIII to Castilla La Mancha and Madrid and the A7 motorway which links Valencia to the European network. Valencia is one of Spain's most densely populated cities and is always busy. It's also a very popular tourist destination. As you enter the city of Valencia, the roads become somewhat confusing and can be hard work. Once in the city, expect to spend time in traffic and parking can be very difficult. The inner city of Valencia is not as large as you might first imagine and walking is the best way to get around. We found that parking near the City of Sciences was a good idea then walk into the historic centre (2km). Valencia has a city bike rental service, www.valenciabikes.com. You can take a guided tour of Valencia by bike at 10am every day. (Tel 963 851 740). The cycle rental system in Valencia has parks all over the city where you can collect/deposit a cycle. When walking round you have to watch out for bikes as they're everywhere. There were a few horse and carriages near the Plaza de la Virgen, offering trips at 30€ a go. Walking tours are a great way to learn about Valencia. At around 15€ per adult and lasting 2 hours, the historic centre walk rund at 11am every Sunday. There are other walks to choose from too. 4 languages available. The tour bus in Valencia is another way to get around although we found it not as good as other cities. The bus runs on two routes (red and blue). We thought the bus was a little fast and there weren't many stops. You do get to see the most important sights but only as you are travelling along. The bus was advertised as an 'open-top' bus but we were unfortunate that the driver we had saw a grey cloud and thought he'd put the roof over, making photography and video impossible. No amount of asking would make him change his mind. At 15€ per person, it was hardly worth it. We got on much better when we decided to walk round. The Valencia Tourist Card may be an option if you plan on travelling a lot as it offers free, unlimited public transport and discounts on various attractions. Cards last 24/48 or 72 hours. Purchase from any tourist office and hotels. Tel 900 701 818. Prices: 24hour 12€, 48hour 18€ and 72hour 22€. Valencia was founded by the Roman Empire in 138BC and has been a thriving city ever since. As such, there's no wonder that there's so much to see in the city. There's a mltitude of historic buildings that remain from every era. Art Deco stands happily alongside classical, Baroque and Renaissance buildings. There's a unique and attractive buliding on every corner. To see the historical centre of Valencia you would do well to make your way to the Plaza de la Virgen (pictured right). This is the heart of old Valencia and once the location for the Roman Forum. This area was once surrounded like an island by the tributaries of the River Turia. This is now illustrated by the fountain in the square which consists of a central figure representing the river, surrounded by seven maidens, representing the tributaries. Today the square is a popular resting place and is constantly full of life. Around this square you will find many important buildings such as the Cathedral, the Basilica and the Palacio de la Generalitat. The Plaza de la Virgen has a handful of cafes around the edge and it's a nice place to sit in the mid-day sun. Snacks and drinks are quite good value. The Cathedral (pictured right), stands on ground once occupied by a Muslim Mosque and an earlier church. 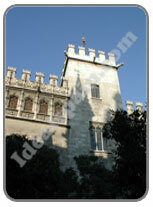 The current building is of Gothic-Cistercian design and dates from 1262. It wasn't actually completed until the 18th century. This is illustrated by the many differing designs incorporated. There are three doors, all in different styles. 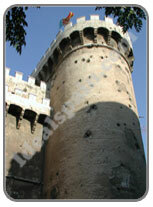 There is an imposing tower which can be climbed using the 200 steps. You will be rewarded at the top with spectacular panoramic views of the city. Purchase a ticket inside the Cathedral (costs approx. 1.50€). You can also purchase books and city guides inside the Cathedral. Watch out for gypsies peddling 'lucky' heather and telling fortunes in this area, although there is usually a high police prescence. Pictured right is the view from the tower over the beautifully laid out gardens. 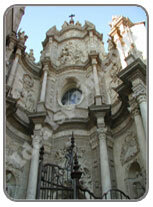 Next to the Cathedral you will find the Basilica de la Virgen, a temple dedicated to the Valencian Patroness. At the altar you will find a beautiful Gothic statue. The Basilica was built between 1652 and 1667 following a style that is considered Pre-baroque. The building is of oval shape with a beautiful painted dome. It is not of great proportions and the building often struggles to cope with the number of worshipers. The City's patron is celebrated on the second Sunday in May when the statue is carried to the Cathedral and back. In a noisy and emotional ceremony, the statue is passed person to person without touching the ground. The evening procession is accompanied by rose petals thrown from the balconies and huge floral displays being built. Pictured right is another important construction in the city. 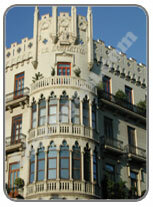 The Torres de Quart is the work of Pere Bonfill and dates from 1444. The walls are pitted with holes caused by French shelling during the War of Independence. The building receives its name because it was once the gateway to Quart de Poblet, an old settlement on the Valencian plains. The towers once formed part of the old city walls, destroyed in 1865 to allow the city to expand. There is another tower in Valencia, called the Torres de Serranos, a massive and bold construction opened in 1400 and still standing strong to this day. The back of the towers is almost as interesting as the front, with its 6 arches in 3 tiers. 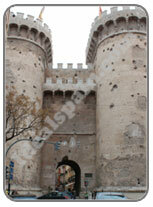 The Valldigna Gate dates from 1440 and was opened by the Moors to allow access to the city. You can still walk through the gate of the Torres del Quart and you can pay a small entrance fee and climb to the top ramparts. Another area of the city worthy of exploration is the market district. Here you will find the Lonja, pictured right. This ancient building was constructed as the market or exchange for silks and other merchants. The building has been described as one of the best civil Gothic buildings in Europe, a fact recognised by UNESCO who declared the Lonja 'Heritage of Humanity', the only building in Valencia to enjoy this title. If you have time to explore the Lonja you will be rewarded with fantastic architecture, a wonderful plaza and some of the finest ceilings in Spain. The wooden panelling is gilded to a very high standard. Entry is free. In the same area you will find the Central Market. Up until 1928 the market was held in the streets. This ceased when the new building was completed. Having a surface area of more than 8,000 square metres, it is one of the largest in Europe. It houses thousands of stalls. It has a great main hall and a side hall dedicated to the selling of fish, both covered by glass domes. If you want to see the best of Valencian city life then this is the place to see it. Pictured right is the central market building, always full of life. You could easily spend a few hours exploring it. There are some great places to grab a snack outside. You can sample tapas and typical Valencian dishes for very little money. One of the most impressive bullrings in Spain, it has four tiers of arches and dates back 150 years. It is totally of red brick construction except the white balustrades. When it was built outside the city walls in 1860, it was the largest bullring in Spain. It seats over 16,000 people. You can find the bullring next to the huge railway station and it's about 10 minutes walk from the historic centre. All in all, Valencia is a vibrant city that offers a wealth of plazas and gardens in which to rest, a wide variety of historical buildings to explore, dotted around the city and blending in with the modern constructions and the added bonus of a thriving port, marina and long beaches. Valencia is the perfect destination for a city break. You can fly in to Valencia airport, take the Metro right into the city and find quality hotels at very attractive prices. Whatever you want from a city break, you will find it in the city of Valencia, day or night. If you're not exploring the city then chill out on the superb beach or take time out in the many museums and galleries. One of the busiest areas of the city is the Plaza del Ayuntamiento, the new vital centre of the city. Here you will find the main post office and the City Council building. Not far from here you will find the North Station, built in 1906, arriving here by train you will find yourself close to the heart of the central historical centre. The post office and other buildings in this part of Valencia are something to behold and totally different to the historical centre. The architecture is amazing. The Glorieta is one of the most important gardens in Valencia. Built by the French during their occupation of the city, the gardens are adorned with busts ans statues. The gardens were the first area in Valencia to have gas lighting in 1844. The Botanical Gardens are owned by the university and were established in the 19th century to serve the pharmaceutical industry and research. The old riverbed through the city has been drained and now houses various sports installations and parks including the City of Arts and Sciences. The Parque de Cabecera is one of the largest parks in Valencia. Others include Jardines del Real (Royal Gardens), Parque del Oeste (West Park) and Parque de Marxalenes, slightly north of the historic centre. The Royal Gardens are worthy of a visit. Here you can see the foundations of the historic moat that used to surround a palace. The largest park in Valencia runs through the dry river bed in which the City of Sciences stands. (See information and photo album here). Every section of the park, between bridges, is different from the last. There's a huge children's play area called 'Gulliver'. It's a moulded image of Gulliver and you are the tiny people. It's of huge proportions and is free of charge to use. There are water features everywhere throughout the park as well as cycle routes, cycle hire, crazy golf and much more. The Costa Blanca is one of the most popular destinations in Spain. The beaches are of golden sand and the resorts range from tiny fishing villages to the thriving resorts such as Benidorm and the city of Alicante. The main beach in Valencia is beautiful. It's very long and straight with a wide, tiled paseo. There are only a few beach bars and restaurants, lots of free parking and facilities on the beach include lifeguards and volleyball nets. The sand is spotlessly clean and golden in colour. It may be said that the Valencian coast consists of just one long beach, interrupted only by a few small cliffs at Cullera. Of the 14 municipalities of Valencia, only four have a coastal strip. In the north you find El Camp de Morvedre with its capital Sagunto. The 57,000 inhabitants are spread between the port area and the old city. The famous castle looks over the old city on a hill, one kilometre long. Sagunto has a Roman theatre dating from the 2nd century, the first such monument to receive official protection. The upper part of the town is very picturesque and should be visited on foot. Explore the narrow streets in the Jewish Quarter. There are also several important monasteries and churches worthy of a visit. Along the south coast is La Ribera Baja, an area dominated by its capital, Sueca. Described as the 'Rice Town' it lies on a huge plain. Its coastal area is a booming tourist centre. The wide Bahia de los Naranjos (Orange Grove Bay) is one of the most attractive areas along the whole coast. The population swells to over 100,000 during the summer. The district of Oliva marks the boundary of the region in the south. It has a magnificent beach and a great deal of history to explore. 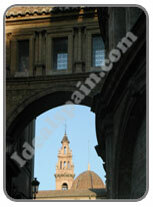 We stayed in Valencia for three days in February 2011 and loved every moment. Valencia is a beautiful city full of history and lots to see. There's so much life and culture there. Valencia isn't the cheapest city we have been to but it certainly is one of the prettiest. We walked our feet off for three days but managed to see most things. Valencia is very clean and the traffic was surprisingly calm. From Valencia we drove south to the National Park in Albufera and through the rice fields to Cullera. Valencia enjoys a typical Mediterranean climate with hot summers and mild winters. It very rarely gets extremely cold in Valencia and there are usually more than 200 clear skies in a year. The nicest thing about the weather in Valencia is that there are no real extremes. The variation of temperature is moderate. When it comes to festivals, Valencia's calendar is full. Much of the city's festivities are marked by huge firework displays for which the city is famous. The majority of fiestas in Valencia are noisy. The most important celebration in Valencia is that of the Fallas which lasts a whole week from the 15th-19th March. It's of such a size that it has been noted as of 'international importance'. It coincides with the beginning of spring and throws Valencia into an explosion of noise and colour. More than 300 huge Fallas (works of art) are erected around the city. Each is a symbol of malicious criticism and sarcasm. The climax is on March 19th when the Fallas are burned at midnight. Easter week (Semana Santa) is also huge in Valencia. 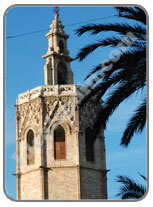 Another fiesta in Valencia worthy of mention is the Corpus Christi which dates back to the 14th century. Valencia was one of the first cities to celebrate Corpus Christi. You can see a diary of Valencian fiestas here. The feria ground in Valencia is located in the Benimamet district and covers over 600,000 square metres which includes parking for 7,000 vehicles. The showground plays host to more than 40 events a year and handles more than 1.3 million people per year. The modern events centre stands out and is covered by a huge glass dome. Close by is the Luis Puig Cycle Track that also plays host to other large sporting events. The rail links with Valencia are excellent with a high speed link with Madrid and other major cities. The network of rail for Valencia covers more than 150km of track and 132 stations. Much of the rail in Valencia is underground, beneath the city. You can see Valencia on the open top tour bus, horse and carriage or by using the popular cycle hire scheme. Valencia also offers a cultural experience never forgotten. There are ample theatres, cinemas, dance halls and entertainment venues. The nightlife pulsates until the early hours of the morning. There are venues to suit every age and taste. This zoo in Valencia has quite a unique design in so much as it has been designed to have invisible barriers between the animals and the visitors. The zoo is divided into several different habitats. More info www.bioparcvalencia.es or telephone 902 250 340. Nearest metro station is the 9th October. Entry to the Bioparc is around 21€ for adults and 15€ for children. You can purchase a discount ticket for the tour bus that includes the Bioparc. You save 10€ per person. The Bioparc is located on the outskirts of the city, at the end of the riverbed gardens. Tour bus, red route runs past it (stop number 7). Being such a large, cosmopolitan city, there's little wonder that Valencia has such a wide range of museums. The Arts and Sciences centre is one of the most important. We have listed most of them below. The Queen Sofia Palace of the Arts was brought back into use in 2006 and is just one place to sample the arts in Valencia. There's a whole network of theatres in the city where a wide range of concerts and productions can be enjoyed, all year round. The Palace of Music has four halls and stages opera, jazz and much more. 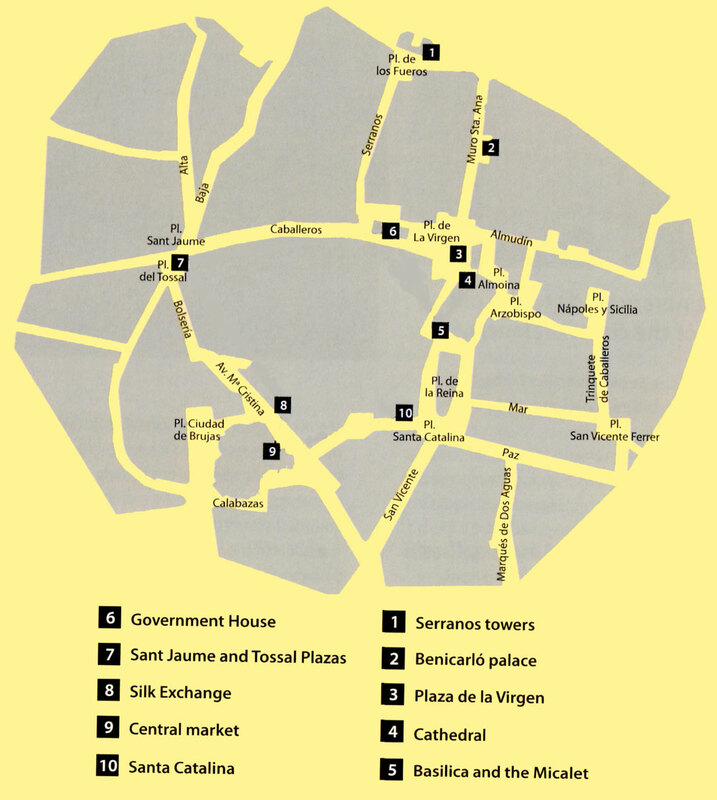 See a full list of museums and galleries in Valencia below. Train station Valencia - Tel 963 520 202 The train station is located near the bullring, south of the historical centre. (ask for Estacion del Norte). Pictured right are some of the modern hotels in Valencia. Learn Spanish Today for FREE! Learn Spanish the interactive and fun way! Our web site will help you learn Spanish free of charge. Not just a few Spanish verbs, but over 500 words of the Spanish language, including complete Spanish phrases and sentences. Watch our free online demo that plays the first 15 minutes of a lesson. In this demo, the in program manual is displayed on the screen.